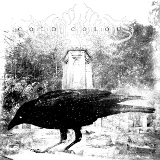 Minnesota group Cold Colours (yes, that's with the British spelling, despite the band's origin, as it is named after a Rotting Christ song) has released a few albums, mostly tending towards a melodeath sound. One always wonders why a band would like to make a self-titled album after a series of previous work -- to inaugurate a new era? Because they think this is the showpiece of their career? Or just at random? Either way, Cold Colours is OK as a melodeath album, but like several of their past albums, it still seems that the band is wandering in search of a sound. The first track, Orifice, sounds pretty good for starters. It's an instrumental that start with jangling clean guitar that quickly turns into fast tremolo riffing, which made me think the band may have decided to go more in a black metal direction on this album. But the following track, Disgust, changes to melodeath with a two-guitar attack -- without a particularly strong melody. They keep switching out riffs and rhythms as if they're searching for a way to captivate the listener, and it seems hard for them to succeed in doing so; the musicianship is good enough, but the songwriting needs work. The next three tracks are slower and more plodding, especially This Devotion and Suffering God, the last of which has ringing picked lead which is rather interesting. It plays well to vocalist Brian Huebner's melodeath vocals, as does A Loss of Faith, which has a weak melody but better guitar riffs that help the tune out a lot (the tremolo picking at the beginning doesn't hurt either). The main problem with this album is in its melodies, which are pretty unremarkable. Huebner's voice isn't enough to save them with either clean or harsh vocals, and his clean ones, unfortunately, are almost completely forgettable. Of Sand and Tears and Silent Speech, in particualr, are ridiculously dreary and boring considering how many great metal songs have been written that are slow crunchers with clean vocals. The final title track, a cover of the Rotting Christ song that started it all, doesn't approach the original, either -- not for lack of trying, but simply because set against overall more competent songwriters and musicians, Cold Colours can't help but fall short. All in all, this is a mediocre album at best, without a lot of hideous failures but without much of a reason for its existence. If one's not a rabid fan of the band, their genre is filled with so many better bands that one can't even begin to count them all. Cold Colours isn't a step in the wrong direction, perhaps -- hard to say -- but it feels, like its tunes, that it may not really be a step in any direction.